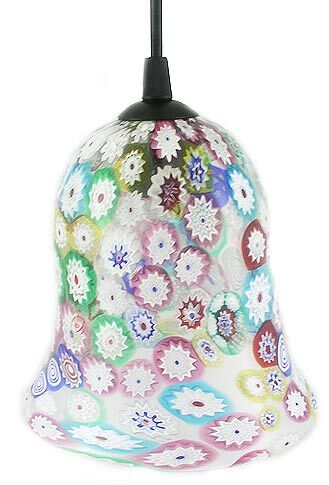 Add a touch of color to your room with this classic bell-shaped millefiori pendant lamp. Handmade of Murano furnace glass, each of these lamp shape shades is approximately 5 1/2 inches tall, flaring to an approximately 6 inch base. Hangs from a black-finished ceiling cover along a color-matched black cable containing the electrical wires. Standard USA candelabra lamp bulb base; reccomend use the energy efficient 60 watt equivalent bulb. Handmade in Murano, Venice, Italy.